For anyone installing sheathing or insulation overhead, this tool provides excellent ergonomic advantages that transform a typically tedious job into something far more manageable. I’ve been looking for a better stapler for over 20 years. I’ve used them all, from the plain silver Stanley and Arrow models, to the reverse handle Powershot products. All of them do the job with some degree of efficiency, but over time hand fatigue always sets in. And let’s not talk about hammer tackers and jams! 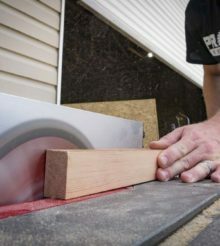 Milwaukee Tool has a great solution for Pros in the siding, flooring, and insulation trades…or anyone doing renovation. I got a chance to really put the Milwaukee M12 Crown Stapler to work on several projects. It takes a strenuous—and, at best, mundane—job and makes it faster and less-physically-taxing. In fact, at $99, the Milwaukee cordless staple gun almost seems to good to be true. That gave us plenty of ammunition for this hands-on review. In addition to benefits, cordless convenience often brings additional challenges to the jobsite. That often shows up as additional weight, loss of run-time, or reduced speed. In the case of the Milwaukee M12 Crown Stapler, there aren’t a lot of downsides. Since a traditional 3/8-inch crown stapler requires a good amount of effort to operate, as much as 20 pounds of pressure or more, the cordless solution relieves the user of considerable effort. Apply this to working overhead, and you can recognize even greater ergonomic advantages. This more than makes up for the additional weight. How much weight? It’s actually not that bad. The Milwaukee Cordless Stapler showed 3.4 lbs. on our scale with a standard M12 RedLithium battery installed. The size of this compact cordless staple gun also impresses. At just 7-1/4″ length and 1-1/2″ wide at the nose, it surpasses a traditional staple gun by an inch in height and two inches in width. It’s compact enough to slide it into, or clip it on, your tool belt without weighing you down. If you do prefer to use the clip, you will immediately appreciate that it dwarfs the standard M12 clips. This one will easily slip over the edge of a thick tool belt, and it lets you easily pick the tool up and put it away as you work. The Milwaukee cordless stapler can operate in the expected sequential mode (pull the trigger, fire a staple). However, it also has a bump fire mode that lets you rapid-fire staples when needed. This can really speed up your job if you’re laying a series of in-line staples. You’ll get as many as 1,500 3/8-inch staples on a single 1.5Ah battery. Doing basic math, that means you can get as many as 3,000 staples off the compact Milwaukee 3.0 Ah battery pack. Because of the added weight—and the sheer efficiency of this tool—I don’t recommend using an extended M12 pack unless you don’t have anything else available. Since the safety mechanism requires some sort of protruding actuator, Milwaukee got it as close to the tip as possible. Even so, the staple still exits the tool about 1/4-inch from the tip. To help with this, Milwaukee added white arrows to indicate where the staple comes out. Honestly, after firing a few sticks you’ll quickly learn how the tool operates. Like Milwaukee Tool’s other cordless nailers, the M12 staple gun has dry-fire lockout, so you immediately know when it’s time to reload staples. To reload staples, you simply squeeze and open the magazine latch, drop in the new stick of T50-style staples, and close the magazine. The power adjustment dial rounds out the final feature on this cordless staple gun. To dial the force up or down, you can use the dial on the left side of the tool. Rotate up in the dial and you move towards maximum force. Down reduces the stapling force. This feature allows you to compensate for when you need to move the Milwaukee cordless staple gun between harder and softer materials. The power adjustment dial is easy to operate, but odds are you won’t have to touch it very often unless you switch between very hard and soft materials. Dimensions (LxWxH): 7.25 x 2.5 x 7.5 in. The proof is in the pudding as they say. We took the Milwaukee cordless crown stapler to a steel roofing job where we needed to secure several pieces of tar paper that would patch bare areas underneath a radiant barrier. Since we were moments away from laying down the barrier with cap nails, stapling the tar paper would save some time (and let us test out the tool!). After being on a roof for an entire day, any shortcuts seemed welcome, and the speed with which the Milwaukee worked approximated what we could have accomplished with our DeWalt hammer tacker. You can go a little faster with a hammer tacker, but we experience so many jams that we’re still on the fence when it comes to doing an entire job. One immediate feature Pros will love on the Milwaukee cordless staple gun has to do with how you bounce between single fire and “bump fire” modes. There’s no switch. You simply press the tool down and pull the trigger for single fire. For contact actuation, just pull the trigger first. When the safety tip is push back against the work surface, the staple fires automatically. In this way you can move in and out of precision firing situations (along the edge of a stud, for example). Working on a roof had me laying the tool down quite a bit as opposed to placing it into my tool belt. Milwaukee placed convenient bumpers along the side of the tool. These took the brunt of the abuse and kept me from having to feel as if I needed to be careful when setting the tool down. I also tested the Milwaukee cordless staple gun while building a home theater riser. It allowed me to quickly secure the carpet to the sides of the riser frame until I was ready to double up on the corners. Obviously, this presented a specialized case, so don’t go grabbing for the Milwaukee M12 stapler when laying carpet over a wood floor or large space! In this application I found staple placement to be critical as I wanted to secure the material without pinching the loops. Using the actuator tip, I was able to achieve very consistent staple placement. I’m not sure who wouldn’t want a lightweight, sub-compact, cordless stapler that runs all day on a single charge. Milwaukee did several things that put this product in the spotlight. First, they designed this cordless crown stapler to be very ergonomic and compact. The fact that you can slip it into your tool belt can’t be stressed enough. The other, possibly more impressive, thing they accomplished involves the price. Those of you already on the M12 battery platform can pick up this tool for just $99. The Milwaukee M12 Crown Stapler kit is only $149 and includes a 1.5Ah battery, M12 charger, and a contractor bag. Like the Milwaukee cordless soldering iron and the Ryobi cordless glue gun, this cordless staple gun qualifies as a must-have tool. For placing housewrap, vapor barriers, and other similar projects, it will likely become your new go-to tool. It’s definitely one of those tools you need for a hurricane. In fact, if you have a use for the new Milwaukee M12 Crown Stapler that we didn’t think of or mention, be sure to leave your thoughts in the comments below. We’d love to hear them. I just purchased one today. I am going to be using in re-upholstering some furniture. I am looking forward to a successful job! It looks like you are just stapling the felt paper directly with the staples, no metal caps in between, which is required in windstorm/hurricane states. Any thots on this? Would also love to see an M12 drywall gun.